Weighed like a lump of meat. Sold like a bundle of straw. It’s time for this slave girl to fight. New York, 1776. The American War of Independence is raging. But Isabel and her sister, Ruth, have their own battles to fight. They’re slaves: the value of their lives measured in money, traded from one pair of hands to the next. It’s always been bad. But now it’s got worse. They’ve been sold to a pair of New Yorkers, the Locktons, whose sadistic cruelty shocks even the girls. (You’d think they’d seen it all.) Isabel vows to protect her little sister and hold on to hope. But when a barbaric act shatters her world, can she finally break the chains that bind her? 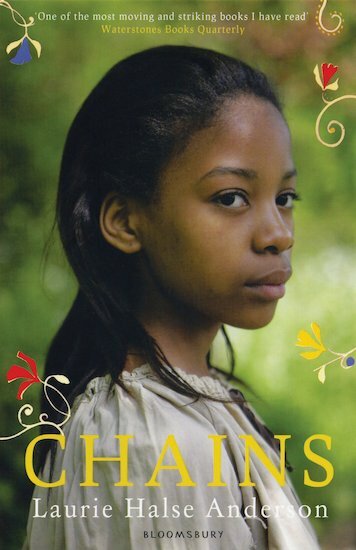 Chains is an incredible story of a girl who longs to be free. Her life is filled with hardship and pain, but she never gives up hope. I couldn’t put this book down until it was finished, and when it was finished I wanted to read it over again! I loved the way that the author expresses just how the characters feel. I really don’t think you can read Chains without tears coming to your eyes. I absolutely loved it.